90 Days of Low-Carb Recipes: Day 15–Mini Cheesecakes–only 1.6 Carbs Each!!!!! Here’s another great finger-food/snack recipe just right for Game Day! One of the hardest things about the first few weeks transitioning into the Low Carb Lifestyle is breaking the sugar craving (for me, anyway). Which means that I try to stay away from anything remotely dessert-like. A great feature with OneNote is the ability to create links to the recipe pages so that I’m not having to search to find the ones I need when it’s time to cook. I consciously named the tab that because, even though I’m only using it for recipes that fit into the low-carb lifestyle, psychologically I need to have those things which fulfill the cravings for the “forbidden”—for the “bad” food. Thus, NoNos. I found this recipe on Pinterest. In a small bowl, combine all ingredients and blend (I used one beater head on my hand mixer) until smooth. 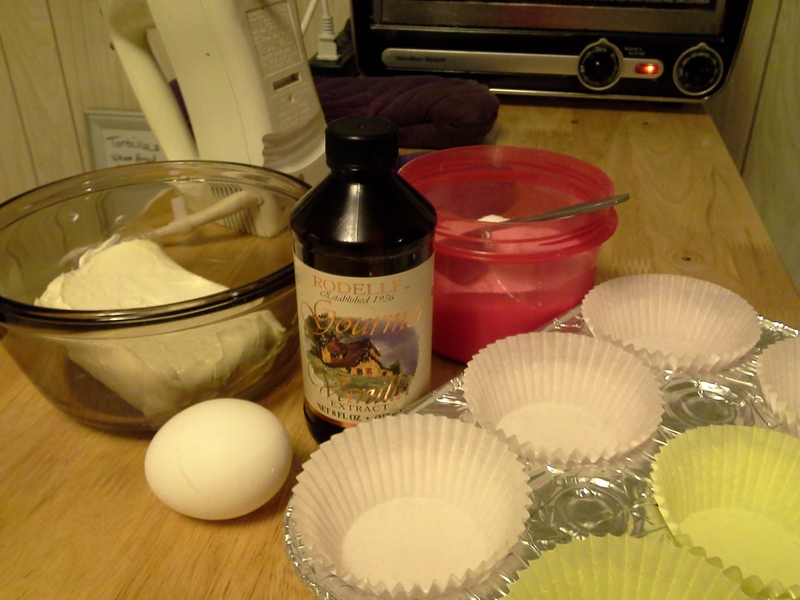 Divide batter evenly into the six paper-lined wells in the muffin tin. Lift the pan by the sides and tap the bottom on the counter top a couple of times to release any air that might be trapped under/in the batter. Bake 20 minutes, or until tops are golden brown and a toothpick/skewer inserted in center comes out clean. Remove “muffins” from pan* and let cool to room temperature on counter. Once completely cooled, they are ready to eat. Store in the refrigerator. I should have cooked these a little bit longer. Even though the pick came out clean, they might have been better if a little more “golden” on top. Chart generated at FitDay.com. 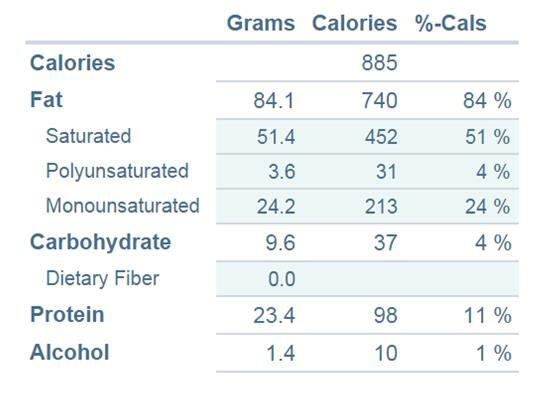 Total carbs divided by 6 servings = 1.6 net carbs each! The original website where I got this recipe says these are 2.6 carbs each, but I plugged all the ingredients into FitDay, and came out with 1.6. If you’re really worried about it, count it at the higher carb count. *I suggest removing them from the pan to let them cool, because mine were very soggy on the bottom, likely from “sweating” inside the muffin tin while they cooled. They will puff up and look nice and fluffy and full when you remove them from the oven. They will shrink considerably once they cool. Next time I make these (oh, yes, I bought two things of cream cheese when I put the ingredients for this on my list! ), I’ll probably increase the Splenda by a 1/2 Tablespoon. Or I’ll wait until I can get out to Costco to get a big bag of frozen berries so that I can have something to top it with. Just plain like this, it didn’t quite satisfy my need for a NoNo. I also probably should have let mine cook just a little longer—that may have helped with the moisture issue I experienced, too. 4 Responses to 90 Days of Low-Carb Recipes: Day 15–Mini Cheesecakes–only 1.6 Carbs Each!!!!! 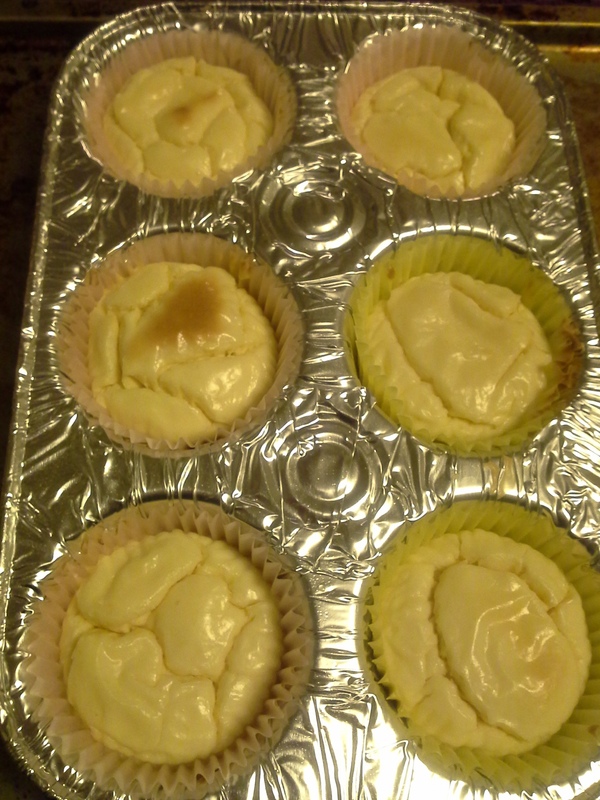 Did you know that they make cheesecake muffin tins? I have a recipe that calls for a mini muffin pan of that type. I’ve not looked for one yet, but I can see it might be helpful. Also, a PT here makes us a cheesecake at Christmas that I’m guessing is either this recipe or one very similar. No crust and not overly sweet. She makes it in an 8×8 foil pan. It’s very good. We add just a little chocolate syrup…sugarfree, of course…when we want a little extra flavor!